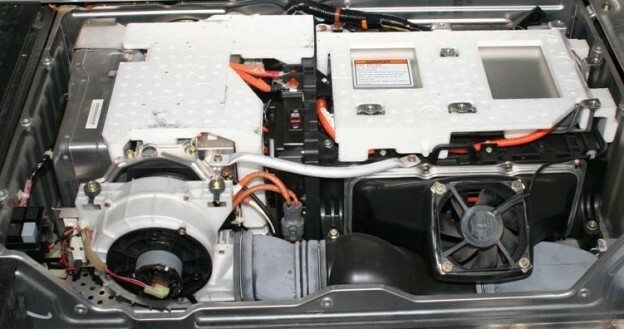 The big concern, with the failing battery pack (ODB codes P1447 and P1449), is that it will not be able to transfer power to the 12v battery under the hood (it acts like an alternator with its DC-to-DC converter) and eventually you will be stranded and unable to start the car. When you Google around, you eventually find the article linked above and some forum conversations about needing to bypass the hybrid battery to make this work. So that’s what I did. Some sockets, Torx T30 bit, and about an hour and I could easily disable the hybrid battery pack and unplug the Battery Control Module (BCM). However, when I started the car up again, it had a very difficult time starting. I immediately believed it was my small under-the-hood battery and went to my local auto parts store for a free test. The battery was good, but needed a recharge. So, I went for a drive on the highway for an hour, at 2500 RPMs. One important weird behaviour happened: Exceeding 4000 RPM trigged the battery and brake lights to come on, but dropping below 3k for about 1 minute would make the lights go out again. This should have been my first clue. Based on my research, the reason it may or may not work is because the trick is necessary for original IMA systems. However, remember, my pack was replaced in 2008 (there was no sticker on the BCM when I opened things up; my second clue). Honda updated the BCM with the pack, and thus they made the trick unnecessary. So, the decision is made for you: if you have an original pack, the bypass will be necessary. If it’s been replaced (I’m guessing that covers 99% of Honda Insights due to the 10 year warranty), then it’s not necessary. Of course, if you need to pass an emissions test, you’ll need a replacement battery pack, because you’ll have that Check Engine Light. :( For me, I’ll be retiring my Insight 3 months shy of its 15th birthday. It was a good run. It’s hard to say why, but I went into the dealership to have any error codes cleared and suddenly everything that was working fine (no large battery) went to hell. Long story short, I was dead in the water. The vehicle would no longer function disconnected from the system as a DC-DC converter and thus I had to either sell a dead car or replace the pack. I replaced the pack for ~$2500 (not at the dealership). It’s running great now, back with a battery, now that its life has been extended. It seems 15 years was just not enough in its heart, so we keep going. I have followed instructions to bypass my hybrid battery in my honda insight 2000 and it is working just fine with one nasty little issue. I live in Pima County AZ which requires an emission test (and) you may not have a “check engine” light lit which results in an automatic failure. When my next test comes due in March, I must fix the light or no license. My mechanic can turn off the check engine light but it comes right back on. The engine, of course, passes the emissions test just fine. I need to find someone or a method to turn off the check engine light pertaining to the bypassed battery or will have to just give the car away and I would rather not. The car has 197000 on it and I have replaced under warrenty, one hybrid battery and twice paid $2000+ since then. It does not make financial sense to keep replacing the hybrid battery at that cost per mile. Without the hybrid battery, I am still getting over 50 MPH in town so could drive the car for many miles more so I would love for the check engine light to go away. Any help would be greatly appreciated. I feel ya, I was in the same position… next emissions text it would fail with the check engine light. No good solution since it’s fixed rules that the emission testing team have to follow. I just replaced the battery pack in my 2001 insight, and nothing changed. The 12 v battery light and check engine light remain on. 12v is good. Any suggestions? I am driving a 2003 Honda Insight CVT. Having issues in that the rpms are running too high thus impacting the mileage. What should i be looking for to either replace or readjust in order to be able to bring down the rpms? Filters, oxygen sensors or possibly is there a software adjustment that needs to be made. Body is perfect and I would like to keep it running. All advice is welcome. After this long I’d recommend replacing the spool valve, oil pressure sensor, and adjusting the valves. Does wonders. I’m looking at a 2000 insight with 32,000 miles. The car hasn’t been used in 7 years, original owner broke his back. It’s red and body is in good shape. He’s asking $2,500 is it worth it? I hope you don’t scrap it in the end as there is a wealth of information to restore the batteries out there, not to mention the fact it is a VERY rare sought after car now. I hope it survives :). I am currently in the market for such a vehicle no matter the battery condition if you still have it! I have a 2010 insight with 107k miles on it. So even though it’s only 6 years old, Honda says it’s out of warranty. My Check IMA light has come on and gone off twice within the past year, and it has just come on again yesterday. Can I continue to drive it? I’m having trouble getting a straight answer from the dealership, since they keep trying to sell me either a new IMA battery or a new Honda, neither of which I can afford right now. Thank you for that assurance. I have a 2000 insight with 326,400 miles and a low battery pack that i do not wish to replace. I get the impression that if i keep driving it it should be ok . i do not need the assist anyway. Are you in a similar position? if so how is it going. Anyone please respond, I do not want to lose my insight!!!! !